Instantly recognisable as a symbol of Spain, there's more to the simple fan than meets the eye. The fan has and always will be popular in Spain and not just for the heat. Fans have been around for a very long time. Indeed they were popular with the Egyptians, Greeks and Romans, not only to keep cool but as a way of fighting off insects. The first reference to the fan being used in Spain is in the 14th century in the Chronicles of Pedro the First of Aragon. A feather fan was included in the gifts from Christopher Columbus to Queen Elizabeth after his first trip to America. As time passed by, fans became not just a practical item but an object of beauty with distinctive meanings. All manner of materials have been used in the making of fans, from rich linen and lace to feathers, palm fronds, other leaves and fine silks. Nowadays there is a mass market for fans and not only can you still buy hand-made fans but mass produced, cheaper versions too. The cheaper fans are often made of cardboard or paper with a plastic framework. They make a great souvenir and you will find them all over Spain. The design of the average fan is a complicated one yet most are made on the same principals. Most folding fans are made of lightweight materials. The material or 'slips' are fixed to a framework of 'sticks' that meet at the 'head' of the fan. The material folds in a concertina fashion when closed. There is a guardstick on each side of the fan that protects it when folded. 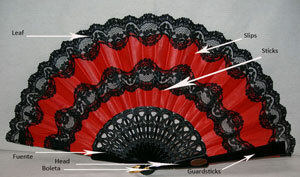 Spanish fans can be plain in colour, mixed colours, fancy lace with cut-outs or printed/painted with fancy images. There are few Spanish women who do not own at least one fan and they are still widely used, mainly to keep cool. Most will have a collection of fans, each to match a different outfit or mood. The fan is also still used as a method of communication between lovers. During the 19th century, when single ladies went out dancing, they were not allowed to meet boys on their own. They would be accompanied by a chaperone who would stay by their side and observe their behavior. In order to communicate with the young men, a secret language was started, using their fans. Depending on how they held or moved their fans, the boys would understand what they were trying to say yet the chaperones didn't.